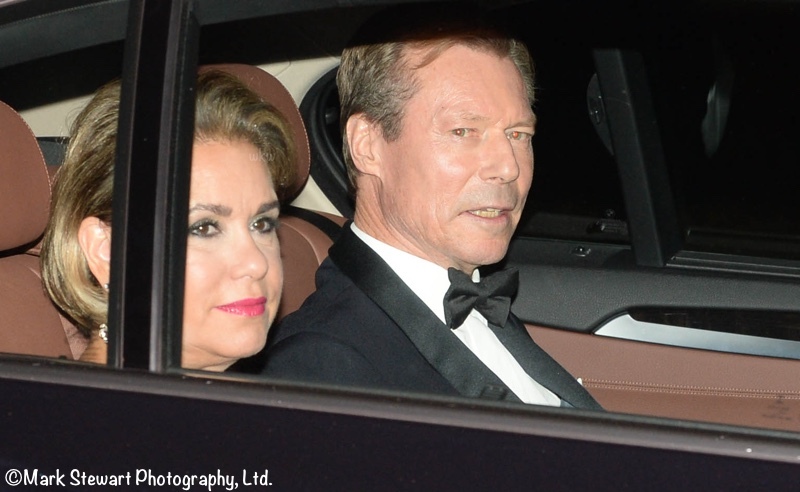 The Duchess was the picture of glamor this evening at Prince Charles’s 70th birthday party. 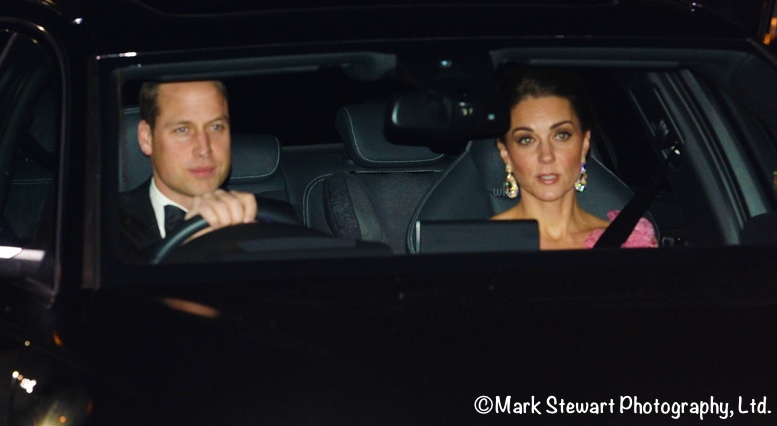 Here you see Kate and William as they left Kensington Palace. They were on their way to Buckingham Palace, where the party was held. There was a full roster of royals attending the elegant affair. Below, the Duke and Duchess of Sussex as they left Kensington Palace. Newlyweds Princess Eugenie and Jack Brooksbank (center). 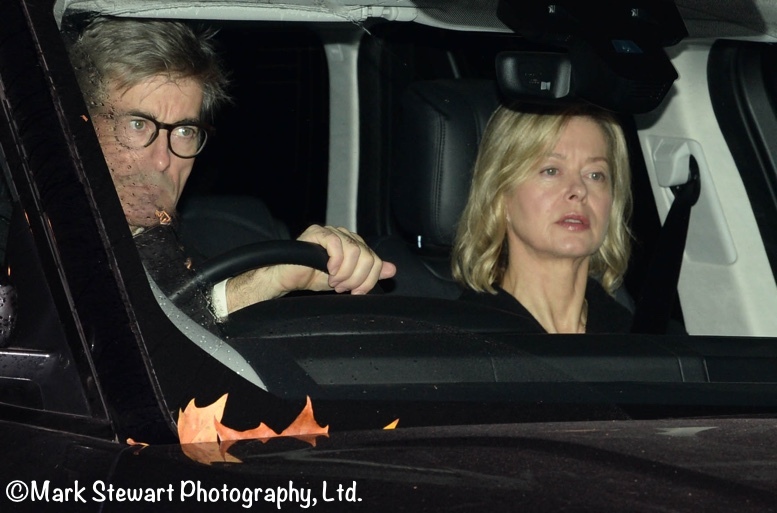 Lady Helen Taylor (the Duke of Kent’s daughter) and husband Timothy Taylor. Prince Philip was at the party, and many other BRF members: Princess Anne and her husband, Timothy Laurence; Edward and Sophie, the Earl and Countess of Wessex; Prince Andrew and Princess Beatrice; the Duke of Kent. It was the hottest ticket in town (in a manner of speaking), and there was no shortage of European royalty. Below, Grand Duchess Maria Theresa and Grand Duke Henri of Luxembourg. The Norwegian Royal Family tonight, from left to right: Crown Prince Haakon, Crown Princess Mette-Marit, Queen Sonja and King Harald. The Royal Family recently revealed that Crown Princess Mette-Marit has been diagnosed with chronic pulmonary fibrosis, a life-limiting condition. You’ll recall the Duke and Duchess’s time with both couples when in Norway this February (seen below); Kate and William are sure to enjoy seeing the family again. Royal photographer Mark Stewart shared a photo of Kate and some of the other European royals at the party. Denmark’s Crown Prince Frederik and Crown Princess Mary as they are leaving Buckingham Palace. And the couple in a photo they posted on Instagram. Heaven reports Crown Princess Mary was in a new Jesper Hovring velvet gown. Other European royals that were reportedly at the event include Belgian King Philippe and Queen Mathilde; Princess Beatrix of the Netherlands; Prince Albert of Monaco. Here is the guest of honor. 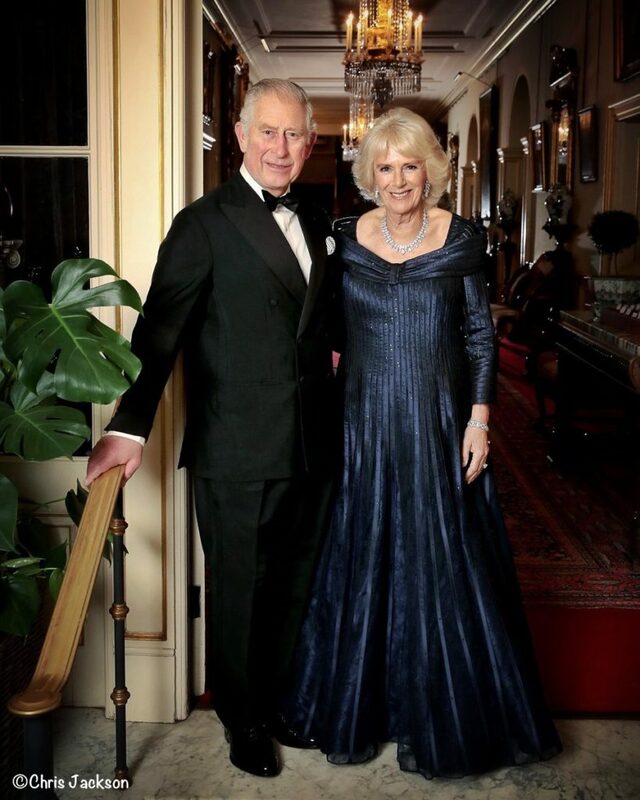 The Prince of Wales and the Duchess of Cornwall are shown in a photo taken at Clarence House this evening just before the party. The Duchess is wearing a rich navy gown by Bruce Oldfield. She spoke as monarch, host and, most importantly, mother. And in some of her warmest words about the Prince of Wales on record, she could clearly not have been prouder. In a toast to celebrate the Prince’s 70th birthday, the Queen has delivered a fond, heartfelt tribute to her son: an “heir to the throne to stand comparison with any in history” and, she joked, a true “Duchy Original”. Her words, in a family not known for their gushing sentiments in public, were remarkable, coming at a dinner in the ballroom of Buckingham Palace thrown in the Prince’s honour. “It is a privilege for any mother to be able to propose a toast to her son on his 70th birthday,” the Queen said in a toast. “It means that you have lived long enough to see your child grow up. It is rather like – to use an analogy I am certain will find favour – planting a tree and being able to watch it grow. You can read the entire toast by clicking here. Earlier today the couple carried out engagements. 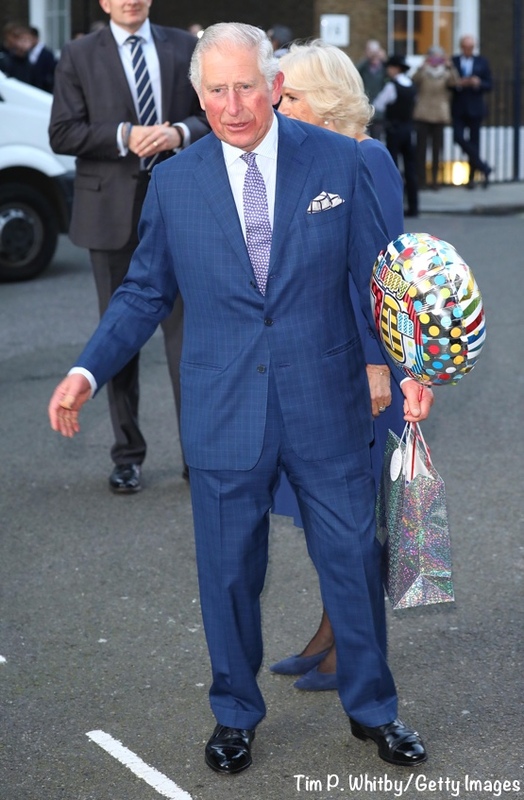 Here you see them arriving at Spencer House for a function; HRH is carrying a balloon and birthday gift from Rebecca English (The Daily Mail), Hannah Furness (The Daily Telegraph) and Valentine Low (The Times of London). Ahead of the royal bash, Prince Charles opened up to reporters about what it feels like to be 70 years old. “I’m not sure. It’s rather like indigestion. ‘Many Happy returns’ are not quite the same as you get older,” he said. Now for a closer look at what Kate wore this evening. She was in a pink one-shouldered gown. It featured softly layered petals of fabric, in what looks something like a silk chiffon. Another view as the Duke and Duchess leave Buckingham Palace. In this closeup, we see that the material at the shoulder is not what is used for the full gown; it changes to a different material at the bodice. You can see a touch of tulle on the bodice in Mark Stewart’s photo above, as well as these close-ups. Knowing the Duchess generally turns to a handful of designers for events like this, many of us are leaning toward the possibility of a bespoke design from Jenny Packham. Laura noted the S/S 2019 collection includes a number of pieces featuring ruffles. There are several other good possibilities, like Alexander McQueen and Temperley London. We will continue hunting for pieces with similar design elements to the few we have seen of Kate’s dress. 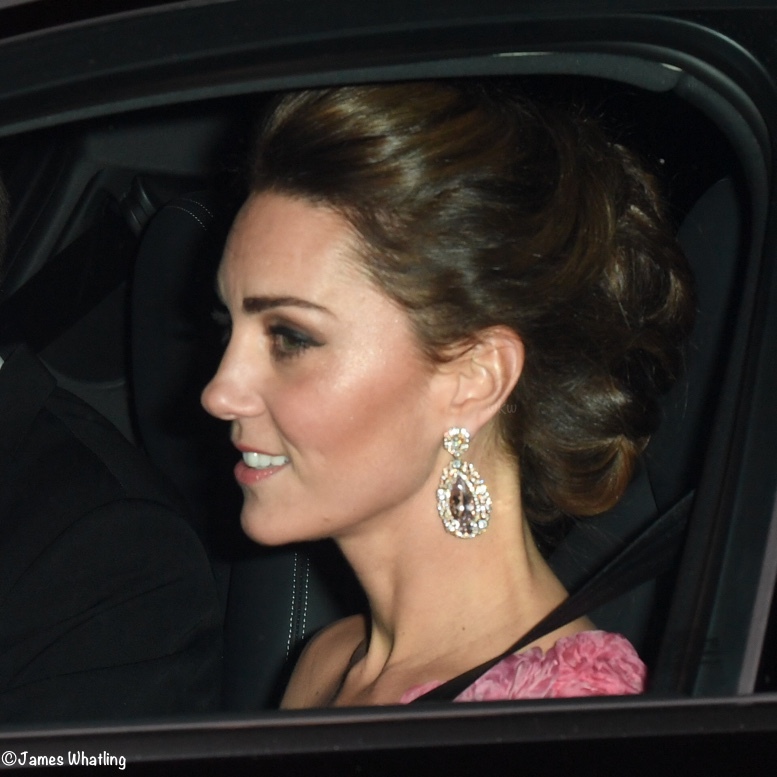 Many recognized the earrings worn by the Duchess. Most recently they were seen at the 2018 BAFTA Awards. Below, another view from the BAFTAs and a look at them when first worn to the 100 Women in Hedge Funds dinner in 2011, although they are barely visible in the photos from that night. It’s been suggested the earrings are quartz or perhaps morganite. They are not pieces on loan from HM; it’s possible they were a wedding gift. Kate’s hair was in an elegant updo that looked terrific. Thursday, Nov 15: The gown is *not* a Jenny Packham creation; HeavenQRF received confirmation of that information today. We don’t know about shoes or other accessories because of the lack of photos. We’ll update the post if we learn anything new about the dress or jewelry. We’ll leave you with this montage of images of Prince Charles through the years. Could this pink dress be a bespoke version of this dress from Catherine Walker? I’m still DYING to see this dress! so impatient 🙁 I wonder why the designer hasn’t tweeted or something that they were behind this beauty. A most intriguing glimpse of Kate’s evening wear tonight and I can’t believe there have been ID possibilities from just the one scrap of shoulder fabric. Kudos to the sleuths! Thanks for the brilliant close-ups to show the change in bodice fabric. 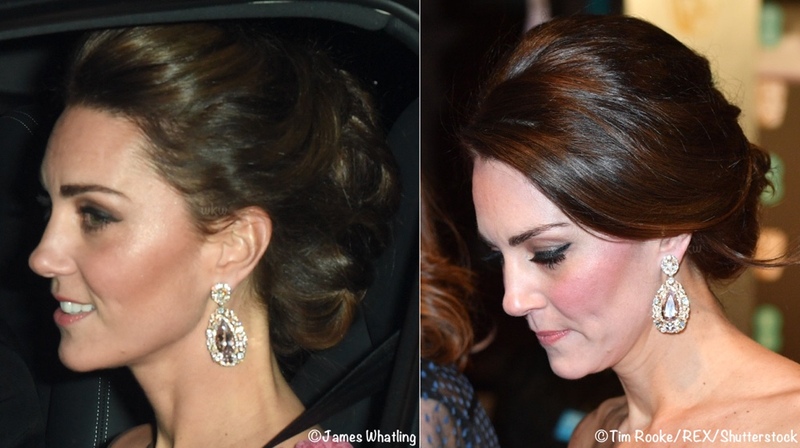 This has to be the most knockout updo Kate has done, she’s definitely developed a strong regal look these days. Magic to see those luscious earrings again. Do they look like Roxanne Assoulin’s Over The Top Mismatched Earrings to you? Thank you 🙂. I’m a long time reader of your blog, and I’m always impressed by your sleuthing capabilities. I’m so thrilled to finally, finally, have had an ID suggestion for you. Like so many others, I do hope we see this intriguing pink dress again and get to see more of it. I also want to call out what Camilla wore. I don’t follow her fashion much, but she looks stunning. Her dress is elegant and flattering–I like the neckline in particular–and the colour is a beautiful foil for her hair. Her jewellery is lighter that her usual pearl choker and really lets her and the dress shine. Wow. This is just a stunning look. 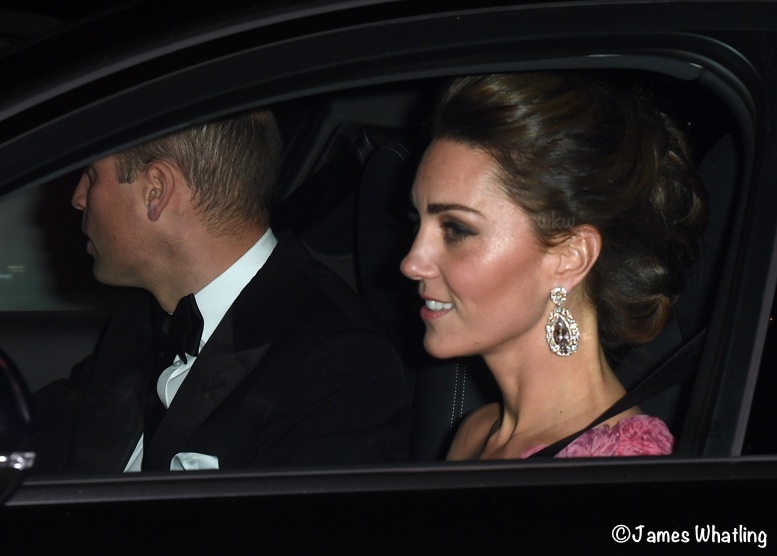 Pink is wonderful on Kate, and the earrings and updo are fantastic. So glamorous– maybe someday we’ll get more pictures of her at this event. Happy birthday to Prince Charles as well! WOW ! how stunningly beautiful Catherine is ! This look is exquisite and should be shown in iconic look. Love her make up, her hair-do, her dress (though just a tiny bit of it) and those earrings ! Fabulous ! 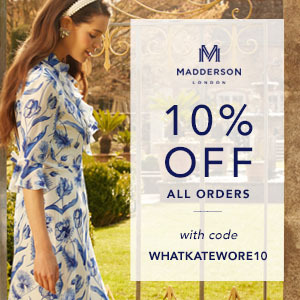 I am totally bowled over ………………the updo, the chiffon dress and it all clicks! Stunning! even though we can only get a glimpse of the dress! Like many other comments I’ve read, I live in hope that we’ll see this dress again! If my memory serves, I can’t recall seeing the DOC in an evening dress in this shade of pink – beautiful! She looks radiant. I like her makeup, but her HAIR!! I LOVE THIS UPDO!! So shiny and elegant and sophisticated! And those earrings love love love – I am by no means a jewelry expert – but definitely diamonds and morganite?? And oh by the way, did I say how much I love her hair? Lol! I really want to see the whole dress, it looks fab! It seems from one of the pictures that the dress may be one-shouldered. I really wish we had a picture because just from the car she looks amazing and I love love love those earrings!!! THANK YOU, visiting Royals, who posted pre-party photos from last night’s birthday celebration on their private Instagram accounts! Besides the Norwegian Royals, shown above, there is a lovely indoor photo of the Danish Royals, Crown Prince Frederik and Crown Princess Mary, on their Instagram account. Maybe more royals will too. After yesterday morning’s trip to McLaren I was hoping Kate might be driving Prince William to the birthday party in that cute yellow McLaren sportscar! She’s looking glamorous and her updo allows those earrings to sparkle and her gown’s neckline to be seen. 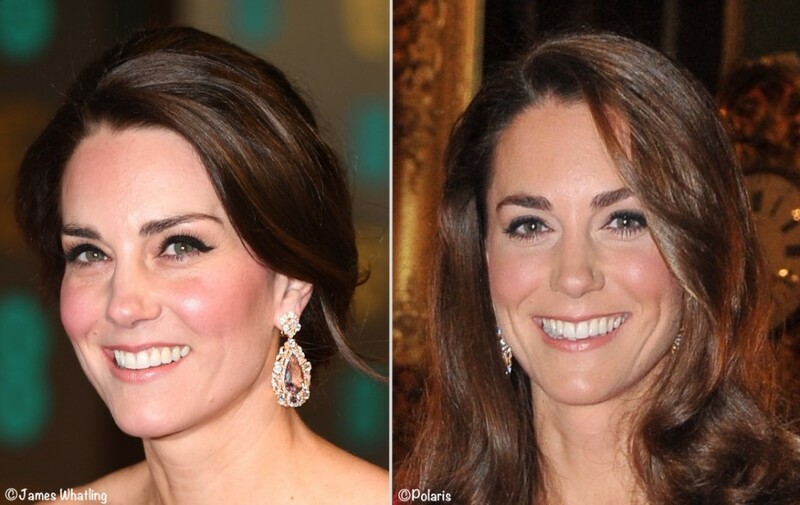 I follow Ella Kay, at The Court Jeweller, who was the one who put the idea in the pot back when Kate first started wearing these earrings that they might have been a wedding gift… given the proximity to when they were first worn by Kate. If that’s true perhaps the gifter was at Prince Charles’ birthday party? Love her hair ! I really like the “looser” updo instead of the tightly pulled back style that she usually wears. I also believe these are the same earrings worn to Pippa’s wedding ? 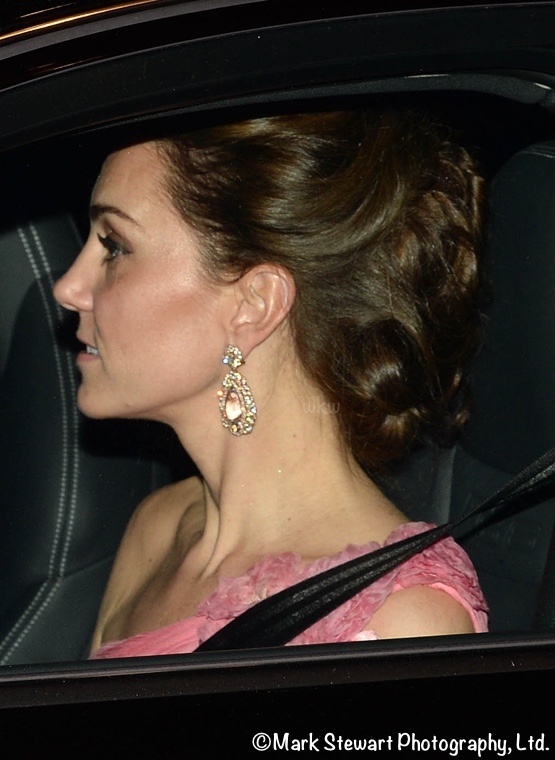 I am a bit iffy on Kate’s updo, from the side it looks a bit odd but maybe someday they will release pictures. Otherwise from the neck up (what we can see!) she looks really beautiful and the blingy earrings really suit her. I’m very curious about the dress–I either tend to love or dislike the fancy gala dresses she wears. She probably will rewear it at some point as she does tend to rewear the fancy dresses. Looks like everyone had a good time! I also meant to add it’s nice to see Mette Marit up and about. I think it was recently announced she had been diagnosed with some severe lung problems which sounded rather ominous? I hope she is feeling better. This is the updo I’ve been waiting for! May the severe, low chignon be gone forever! Oh my! Radiant is the first word that comes to mind. Her makeup is gorgeous and she looks so happy! I love those earrings and the pink material we can see looks exquisite. Her hair though is really the winner here. The last few up dos (state dinner and green Catherine Walker coat) have seemed flat to me. There wasn’t a lot of body to those updos and her hair seemed dull. But this updo was phenomenal. Her hair looked shiny and full bodied. Obviously, this updo wouldn’t have worked for the Remembrance event but I hope she recycles this updo for future black tie/white tie/ formal events. I do hope we get a picture of the gown because I suspect we will all love it. I really hope BP releases a group photo, with so many Royals in attendance they must have taken photos. Those earrings – are they semi precious or paste? Are they real gold and diamonds??? I think they are real too as she has only worn for important black tie events. For a huge important and glitzy event like this with so many Royals present I really don’t think she would wear costume jewellery. Over at Court Jeweller site where the jewel experts congregate I’ve seen people suggest morganite for the central stone and smaller diamonds for the outside. I want to see a picture of Kate’s dress. Do you have one? Kate looks splendid and I love the hairstyle! Wish we could see more. The Queen’s remarks were really touching. How extraordinary it must be to have your mother around on the occasion of your 70th birthday. If only we could all be so lucky! From what we can see and Kate’s affinity for vintage, there seems to be a 60’s vibe to her look. Fabulous. Kate can rock any decade. Completely agree that Kate has a vintage 60’s look going on here and it’s stunning. From what little we can see, I think this is the best she has ever looked. If the severe, low chignon reappears, I will be so disappointed now that this has become a reality. Her updo does seem very 60’s!!!!!! I’ve been trying to put my finger on what Kate’s updo reminded me of and you hit the nail on the head! Yes- I agree that it is very ‘60s retro. 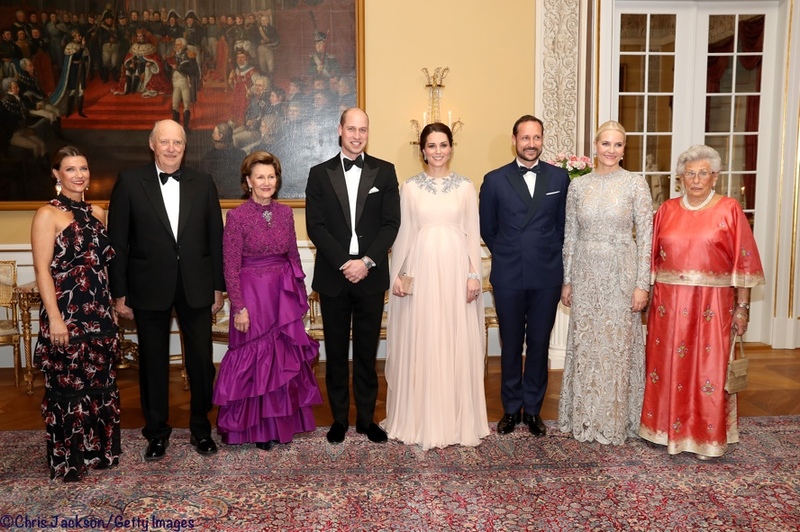 How funny is it that Crown Princess Mette-Marit and Queen Sonja are wearing the same gowns they wore when William and Kate visited them last year? I wonder if it was intentional or just one of those odd coincidences? This is one of the best updo’s Kate has worn in a long time. The tiny bit of volume at the crown, plus getting it all up instead of the chignon at the back of her neck are both very flattering and instantly lifting to the face. Her makeup looks lovely and she appears to be happy and content. I really hope we get to see a full length view of this gown some day in the future. The earrings are most likely Morganite and they have a slightly pink tone to them which looks nice with the pink gown, but I would have gone for some real bling here and either worn the chandelier diamond earrings loaned by HM or asked very nicely to borrow some other gorgeous earrings from the royal vaults. The BRF has increasingly fewer opportunities to really go for it with white and black tie events, so the magpie in me would jump at the chance to wear some serious jewels. I thought all the photos of Princess Mette-Marit and Queen Sonja were older photos and not from last night? I could be totally wrong here, but I thought the photo of Queen Sonja and family was taken when William and Kate visited them, not a photo from Charles 70th. Susan??? Love, love, love those earrings. Prince Charles is allegedly quite opinionated about women’s clothing, so it is lovely that Kate appears to have debuted an amazing, new dress for her father-in-law’s birthday. The fabric at her shoulder may be organza, not chiffon. Seriously, Kate looks fabulous. Love, love the earrings and from what I can see I love the dress. I don’t think they’re feathers though, I think it’s fabric. OHHHHHH SOOOO Fabulous. The duchess looks absolutely marvelous in bright pink and we have seen her in it more and more. Her hair up and high looks so wonderful and dazzling on her. The earrings so beautiful. One never gets tired of looking at her remarkable beauty! Will hope that an additional picture sneeks out! So happy to see her in what looks a bit more daring! Oh to be a Duchess! It is a magical dress on the breath-taking DOC! We rarely seem to see her in pink! What an updo! I want more photos!!!! Sad to not see the dress, as it appears to be a more vivid color than she usually wears that I would like. Her updo is MUCH improved…softer and less fussy than her usual fancy ‘dos. I don’t love the earrings though…they seem very heavy. I ADORE Meghan’s earrings, though, that she also wore on the tour. I am sad that they are far out of my price range. 🙁 I will just have to wait for someone on Etsy to make a similar pair. I don’t quite get why the comment ‘her up do is much improved’. Catherine has naturally gorgeous hair and her updo is ALWAYS BEAUTIFUL. hence, there is nothing to improve. Her hair is never fussy and fancy. In fact I do not recall any of her hair-do which I don’t like. She knows when and how to pull off glamorous and striking styles. Her updo is different for this special occasion and she will have a different style again for another event. Wow!!! I can’t believe this looks to be one of her most stunning looks EVER and we won’t get any pictures. Her hair looks phenomenal. I didn’t think her hairstylist was capable of anything besides that chignon. I do love those earrings everytime she wears them. Even if they won’t tell us who bought them I do wish we could get information on what stone they are made out of. 7 years on and we are none the wiser! I’m a bit confused. In the picture above of the group of royals at the party including the Norway couples, Kate has on a dress that is nothing like the glimpses of her dress when she’s in the car. In the photo of the group her dress is a pale pink or blush with a high embellished neck and a cape. The Norway royals have on the same dresses shown in other photos from tonight’s party. I’m I just “off” tonight and having a senior moment? After all, I’m seventy like Prince Charles and those moments do come along from time to time. BTW, I think Camilla looks stunning. The dress is a beautiful color and suits her perfectly. It took me a moment too and had to re read. Even then I don’t think the post made it all that clear but that picture is from their visit to Norway, the Norwegian royal family just happen to be wearing the same. Thank you, yes, you are right. I somehow missed that in the first reading. The photo above that includes the Cambridges is from earlier this year, during their visit to Norway. 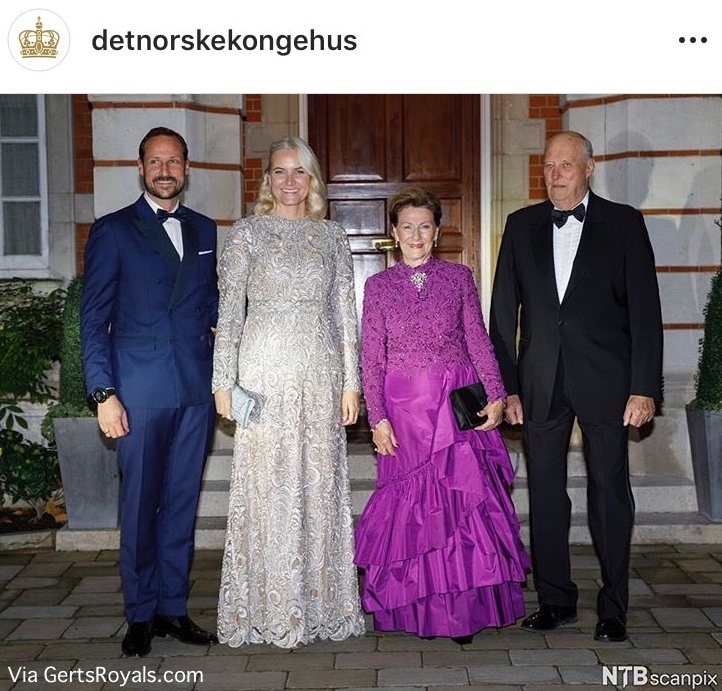 But it seems that Queen Sonja rather likes that purplish dress: I did a quick Google image search using the London photo of them in this article, and found some instances of her wearing the same gown at other events. They included a reception for the 2016 Nobel Peace Prize winner. I assume that Mette-Marit similarly chose a ‘repeat’ gown. I am NOT saying the royal ladies are too poor to have more than one dress (goodness knows they are exponentially wealthier than I am) but I believe the Scandinavian royal families do not have the personal wealth that the BRF has. To bad we didn’t get to see the entire look. I infinitely prefer this hair-do to the one she on the morning of Remembrance Day, which is to bad because otherwise her look was exquisite. Unlike others, I like the headband and the do she wore with the Catherine Walker coat. I love seeing Kate with different types of looks for different occasions. She is matching her looks with the different levels of formality these events are calling for. Diana used to do this effortlessly, but it’s a gift few have. She did famously well as her own stylist. Kate needs a little more help and I would still like to see her working with a professional, but I think she is getting there. My goodness, this gown, the hair, the jewels… it all looks like it’s an absolute dream! But it’s a nightmare that we can’t see the whole thing! I shall offer prayers to the fashion gods that somehow a full length pic becomes available. And I agree with a poster below who stated how joyful her pink dress is for a celebration. Kate must have looked like a happy little beacon of celebratory fun for the night… and ultra glamorous of course. Her updo is giving serious Swedish Nobels hair vibes (ala CP Victoria). All it needs is a tiara! I hope we see this type of updo more often. Ahh I wish we could see the whole look! I’m usually not a fan of this shade of pink, but it’s a very joyful choice for such a happy celebration! I would’ve been quite sad if she wore a dark colour. I wonder is Kate and Meghan talk about what they’re going to wear beforehand. I know I would, and they seem to be friends, and are neighbours! Their earring choices are quite similar today. From what we can see, Kate looks exquisite. Her hair is in a very elegant up do and of course those earrings make a grand statement. The pink of the dress looks striking and the one sleeve treatment is a unique look for Kate. I’m certain that I express the thoughts of royal watchers everywhere, when I say that with the exception of Camila, who looks very nice, it is a great disappointment not to see what the ladies are wearing. This would be a night of high fashion with royalty from many nations. Hiss boo, to whomever decided that photos were not allowed. Hopefully we might see Kate’s and Meghan’s dresses on another occasion. There are two Marquesa Resort 2018 gowns on which her gown may be based. I second Laura’s question here. I realize the lace blush pink Marchesa was quite revealing, but the red Marchesa Notte she wore to the theatre was spectacular! It’s one of my favorites. Google Harvey Weinstein. Harvey provided funding for his wife, Georgina (sp?) Chapman to start Marchesa. The ironies abound. Oh, my bad, had not remembered that connection. Of course not! Thanks for your kindly gentle response. No need to apologize, none at all. When thinking about Mr. Weinstein the majority of people would not think about fashion. At any rate, Georgina Chapman, one of the brand’s co-founders and owners, was married to Harvey Weinstein. (I believe their divorce is final but am not 100% sure.) There are allegations female stars were *strongly* urged to wear the brand at red carpet events. Ms. Chapman says she was unaware of this; even so, wearing a Marchesa gown is a step down a path I don’t see Kate taking. Thanks so much for sharing this connection! I hadn’t heard this before. The detailing at the shoulder made me wonder if it was McQueen simply because there was a similar rosette embellishment on the dress she wore to the recent state dinner. I realie that’s a huge stretch and obviously McQueen isn’t the only design house that uses them! The color is beautiful and I love her updo tonight—I wonder if the floral embellishments were meant as a nod to Charles’ love of gardens? Really wish we were getting full length photos from inside the party! So wish a pic of that dress surfaces. Hair looked amazing, and love those statement earrings. Absolutely beautiful! And all we’ve seen so far is from the neck up.. the hair the makeup, its all so pretty! Those earrings are incredible. She looks great and I bet they had a fun night! Looks like something really special!! It’s KILLING ME that we can’t see the whole look! But what we can see is just splendid. Her glamorous updo, those magnificent earrings. Obviously we can’t see enough of the dress to form an opinion, but I do think that something pink and fluffy is a really joyful choice for a birthday celebration–pure happiness. Camilla’s dress is beautiful and suits her so well. Is it just me or has she gotten very slender in the last few months? I was thinking, when the family photos came out, how very trim she looked in her white suit, seated at an angle that’s not always flattering and next to her movie-star-beautiful daughters-in-law. This updo looks different than her usual tightly woven chignons. Very glamorous indeed! I hope we get to see the rest of this frock. From the glimpse we got, it looks like a showstopper. I have thought of Giambattista Valli Couture for the dress. Very much that style. Although it does not perfectly match any design from the past 2 couture seasons there are several ones that could have served as inspiration. Congratulations on your wonderful website.